Roseanne Review - TV Revival Trend Gets Serious, Possibly Too Serious - Are You Screening? The trend of reviving sit-coms from decades past is a bittersweet undertaking at best and that is perhaps most true when it comes to Roseanne. The nostalgia inherent in a return to a show we once loved is mixed with the fairly depressing thought that new ideas are this scarce, and that the cast has nothing better to do. Worse still, should things go wrong, the result is going to be something that showcases all the wit and creativity it takes to go back to a long-dead show with 100s of episodes behind it. With Roseanne, when the original wasn’t quite hysterical, it was at least a lot of fun, and you have to know that the people involved are still going to be able to produce the laughs. What you have to wonder is how buried they’ll be. Much like the original, the revival is funniest when its characters interact with each other about each other. Unlike the original, it’s so focused on social commentary, it doesn’t have as much time to worry about being funny. Though Roseanne always served as a kind of “social discourse by proxy” (much like All in the Family), the new version amps this up quite a bit… at least, so far. Long before the show aired, Roseanne Barr drew attention to it when it was announced that Roseanne would be a Trump supporter, just as Barr is in real life. This obviously polarized potential viewers, not least because there are other actors attached to the show, and, for some, working with a Trump supporter already raises questions, nevermind actually putting the views forward in the content of the show. I mention this because it shows up significantly in the pilot episode, even to the extent that the fact has strained relationships for the characters, and the show can’t seem to find the meat, or comedy, in the effort. When pressed, and presented with the idea that Trump may not be the nicest, most woman-friendly person on the planet, Roseanne apparently has no idea why she voted for him, except to say that, “he talked about jobs,” and no one involved in the show seems to realize that this is just to have her call herself stupid. Actually, lots of them might know. It’s odd and uncomfortable, really no matter which side you’re on, and it isn’t even a fraction of the social/political debate the show sets its sights on within the first few episodes. Where Roseanne was once able to focus on an “every family,” it now wants you to hold its beer as it struggles under the weight of becoming the one family that absolutely everything happens to. Don’t get me wrong. The joy inherent in Roseanne was always the conflict and clash that ultimately led to a view of familial happiness as achieving something more akin to a cordial detente than anything so sit-com standard as a syrupy bag of loving relationships. Whether Darlene was disgusted by loose meat sandwiches, or Roseanne was trying to get Jackie out of an abusive relationship, it was filled with every part of the conflict spectrum. The difference now, apart from the apparent quid pro quo going on behind the scenes as the actors throw out their social angle demands, is that it used to be far more about the people having the conflict than the conflict itself. Now, not only do we not necessarily get any rationale behind some of the conflicting views, but people are outraged about things I didn’t even realize had an opposing side, much less a side I can make sense of a particular character having. The conflict still works in some parts of the new version of the show, but everything happening feels the most connected to the original when Barr isn’t on screen, or at least isn’t part of the conversation. At one point during one of the episodes available for review, Darlene and Becky are discussing going after the same job and why they each think it is more important they get it, and it becomes almost jarring to suddenly catch yourself in something that feels like an actual continuation of the characters. As we enter the show, Darlene (Sara Gilbert) has just moved back home with her two kids. Roseanne wakes Dan (John Goodman), and we are immediately on notice that there will be no explanations when it comes to divergence from the series finale. 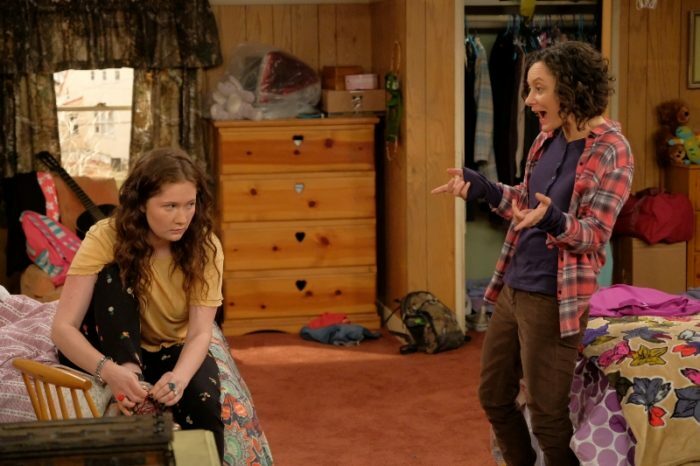 Darlene’s kids, Harris Conner-Healy (Emma Kenney), and Mark Conner-Healy (Ames McNamara), aren’t given much to work with in the early stages of the show, but quickly become the best parts of it. Harris is basically New Darlene, and Mark takes a while to get past merely being the gimmick that opens the statement door, but when they get some space they take over. It makes you wish this ended up a spin-off with Darlene getting out of Lanford with Aunt Jackie. By the way, Darlene, both generally and further as the person whose kids have hyphenated last names with her name first, having nothing to say at all about Trump, or even come anywhere near the conversations feels like a special line in a contract. All that said, as much as there may be some weird shifts involved, and for all that Trump love or hatred may move people to find or avoid it, it’s still a system that was on the air for so many years for a reason. It’s a different take on how that system functions, and it has all aged. It may be irritating more frequently. It may need to settle in for a few episodes. But, it’s still hilarious when it all comes together. We know the pieces are, mostly, all there, and the only question is whether Barr wants a soapbox or a sit-com. If it goes hard soapbox, and there are hints that it might, after five episodes this will be one of the biggest ratings plummets in a decade. If it just lets fans and newcomers catch another taste of what made the original, it could be on another five years (even if I don’t think the cast necessarily intends to stick around that long).